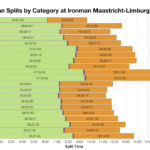 A lighter weekend of racing just gone with only one event: Ironman Maastricht-Limburg. 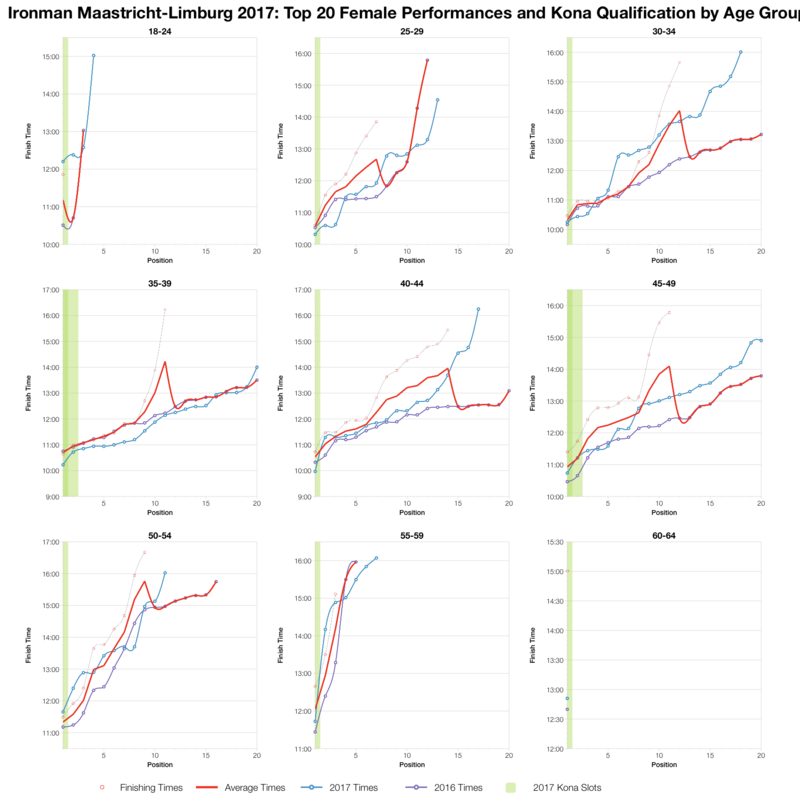 This is the third year for this Ironman, it drew a relatively small field of around 1,000 athletes and offered the regular 40 Kona slots to competitors. 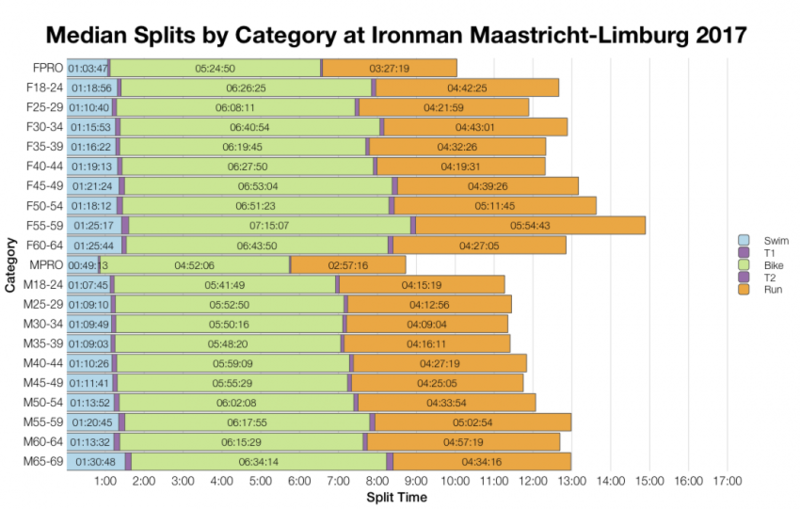 As a race, results have so far fallen in the middle of European races, this year doesn’t look to be an exception. 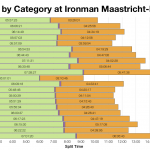 This year’s race appears to have been slower on the swim, faster on the bike and about the same on the run meaning the overall distribution is similar to the previous two years. There’s nothing in these results that indicates anything exceptional about this year’s running of the event. Noting that this year’s statistics exclude the DNS numbers present in the previous two it’s still clear the the DNF rate was at its lowest this year. Both bike and run DNF numbers are lower so we can be confident the overall is too. 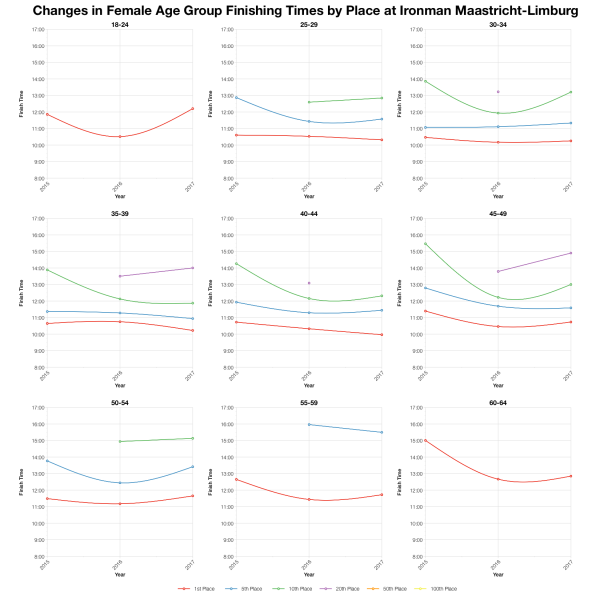 With smaller fields – two years of racing in Maastricht have had around the 1,000 athletes or lower – there’s a little more variability in age group medians. 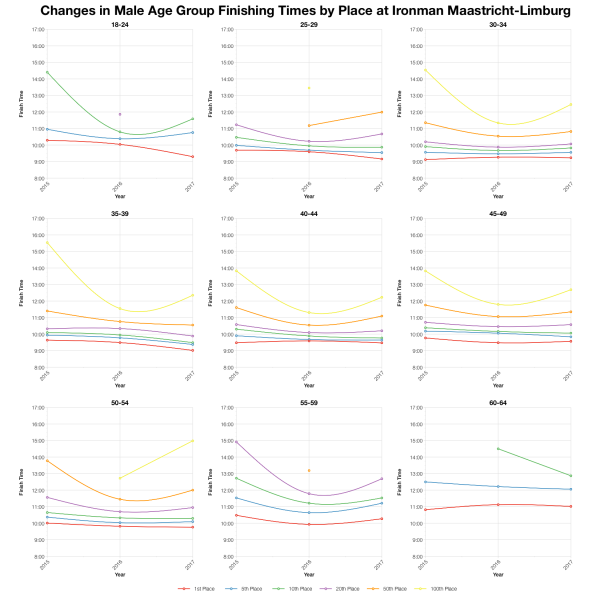 Still, the trend of slower swim, faster bike and similar run is largely present in this view of the results too. The race drew a broad spread of Europeans with the Germans likely to have taken home the most slots. Tracking positions within age groups over the last 3 years gives the clearest signs of the variability across the field. 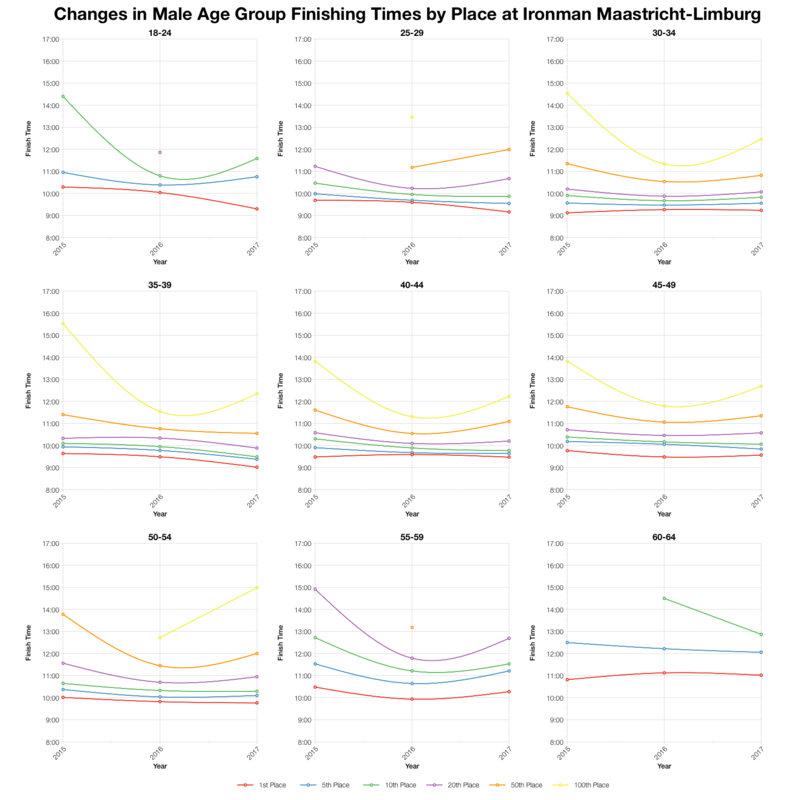 Front runners are often faster, but further back in an age group and we see times drop off for the place. Some of this a reflection of field size and depth – with a smaller field 50th place in some age groups will be nearer the back. While this variability is present most times don’t deviate too far from previous results. 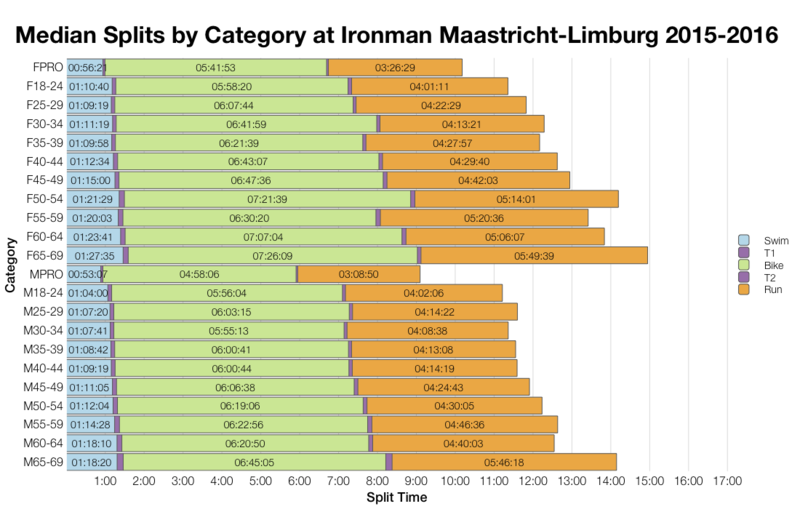 Based on the results list I’ve estimated the allocation of slots likely at Ironman Maastricht-Limburg, actual allocation may vary. Assuming these slot numbers I can then calculate automatic qualifying times for each age group before roll down takes place. 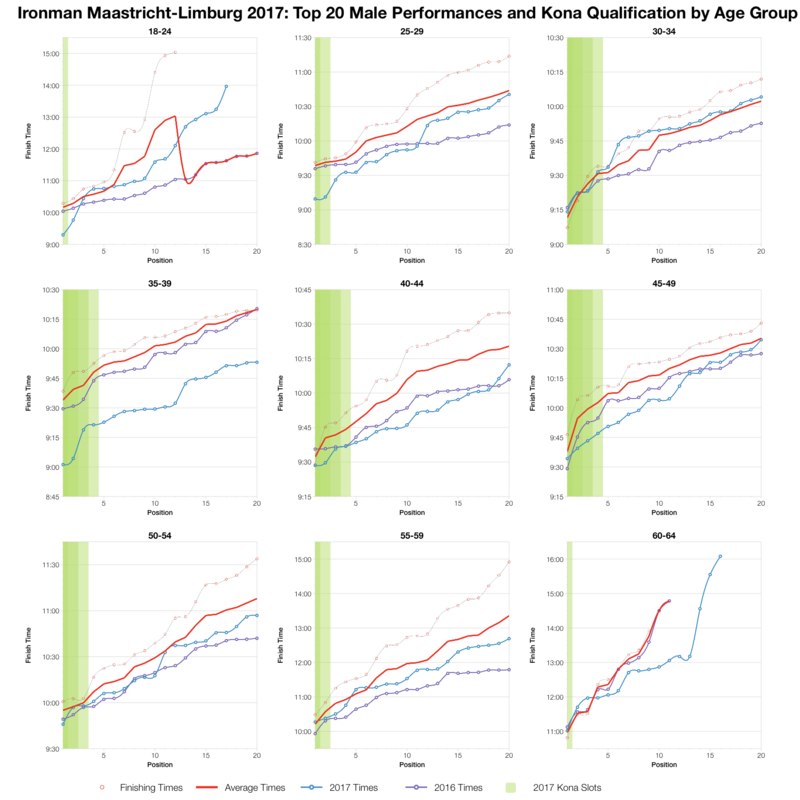 For more statistics on Ironman qualifying times, check out my Kona qualification page. 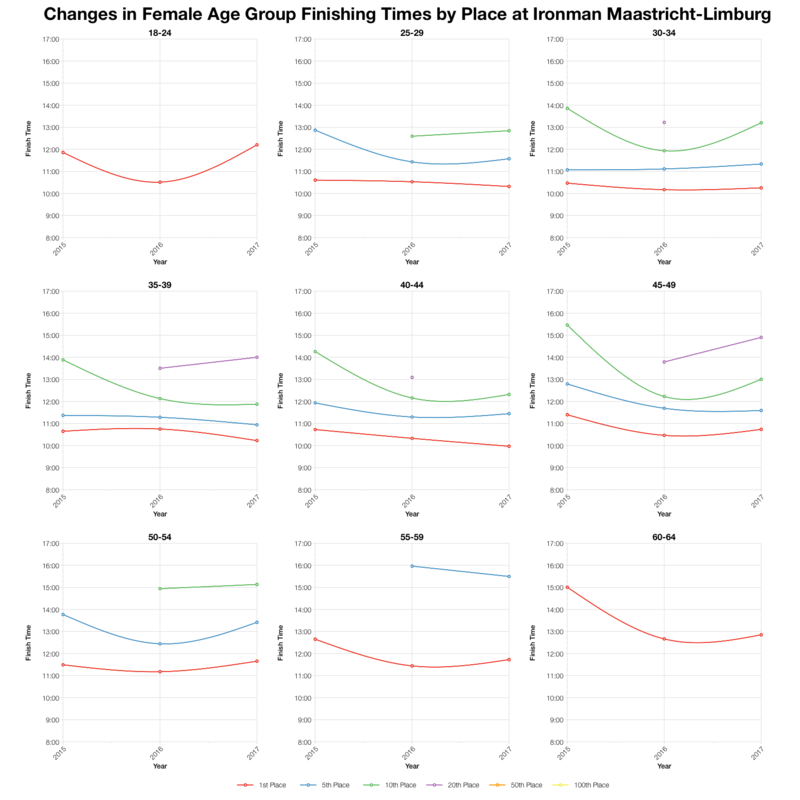 Although it’s not true of all age groups, for a good number the top twenty trends faster than average. Most notably, the M35-39 category produced the fastest results for the course yet, a significant step up on the previous two years of racing. Again variability means not every group performed so well. 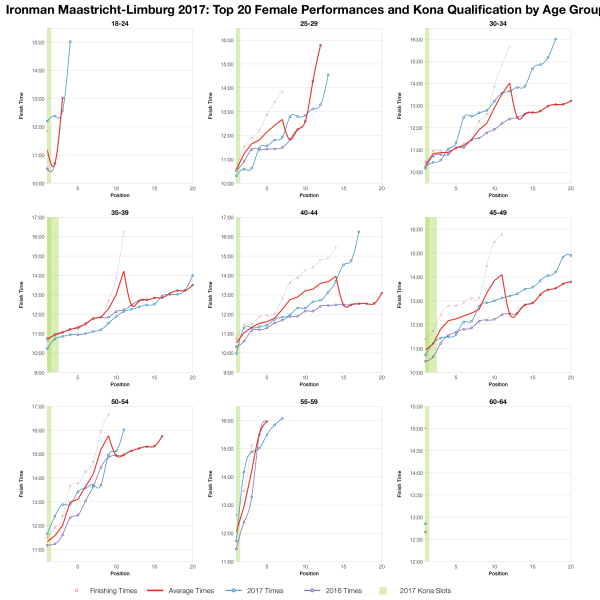 However, while the race overall looks to be quite similar to previous years, the Kona qualification times appear to have trended slightly faster. 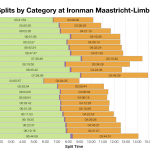 You can access a spreadsheet of the full results from Ironman Maastricht-Limburg 2017 on my Google Drive.